The President’s agenda — environmental responsibility, protection of voting rights, educational excellence, immigration reforms and financial security for all — speaks to the proactive values the Jewish community embraces, especially providing a livable minimum wage and pursuing gender equality in the marketplace. The National Jewish Democratic Council’s will promote the values espoused by the President, with particular emphasis on promoting the landmark Affordable Care Act. Last, but certainly not least, NJDC is grateful for the continued bi-partisan support for the State of Israel. Once again, the Administration has been explicit about supporting Israel’s security and essential national character. 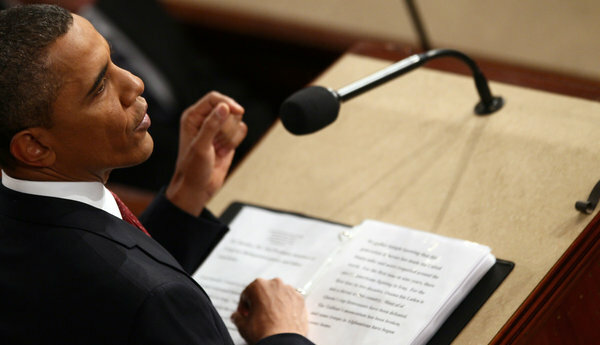 Complete transcript of President Obama’s 2014 State of the Union Address follows the jump. Here are the results of your efforts: The lowest unemployment rate in over five years. A rebounding housing market. A manufacturing sector that’s adding jobs for the first time since the 1990s. More oil produced at home than we buy from the rest of the world — the first time that’s happened in nearly twenty years. Our deficits – cut by more than half. And for the first time in over a decade, business leaders around the world have declared that China is no longer the world’s number one place to invest; America is. The question for everyone in this chamber, running through every decision we make this year, is whether we are going to help or hinder this progress. For several years now, this town has been consumed by a rancorous argument over the proper size of the federal government. It’s an important debate — one that dates back to our very founding. But when that debate prevents us from carrying out even the most basic functions of our democracy — when our differences shut down government or threaten the full faith and credit of the United States – then we are not doing right by the American people. In the coming months, let’s see where else we can make progress together. Let’s make this a year of action. That’s what most Americans want — for all of us in this chamber to focus on their lives, their hopes, their aspirations. And what I believe unites the people of this nation, regardless of race or region or party, young or old, rich or poor, is the simple, profound belief in opportunity for all — the notion that if you work hard and take responsibility, you can get ahead. One of the reasons why is natural gas — if extracted safely, it’s the bridge fuel that can power our economy with less of the carbon pollution that causes climate change. Businesses plan to invest almost $100 billion in new factories that use natural gas. I’ll cut red tape to help states get those factories built, and this Congress can help by putting people to work building fueling stations that shift more cars and trucks from foreign oil to American natural gas. My administration will keep working with the industry to sustain production and job growth while strengthening protection of our air, our water, and our communities. And while we’re at it, I’ll use my authority to protect more of our pristine federal lands for future generations. The bottom line is, Michelle and I want every child to have the same chance this country gave us. But we know our opportunity agenda won’t be complete — and too many young people entering the workforce today will see the American Dream as an empty promise — unless we do more to make sure our economy honors the dignity of work, and hard work pays off for every single American. Today, women make up about half our workforce. But they still make 77 cents for every dollar a man earns. That is wrong, and in 2014, it’s an embarrassment. A woman deserves equal pay for equal work. She deserves to have a baby without sacrificing her job. A mother deserves a day off to care for a sick child or sick parent without running into hardship – and you know what, a father does, too. It’s time to do away with workplace policies that belong in a “Mad Men” episode. This year, let’s all come together – Congress, the White House, and businesses from Wall Street to Main Street — to give every woman the opportunity she deserves. Because I firmly believe when women succeed, America succees. Now, women hold a majority of lower-wage jobs — but they’re not the only ones stifled by stagnant wages. Americans understand that some people will earn more than others, and we don’t resent those who, by virtue of their efforts, achieve incredible success. But Americans overwhelmingly agree that no one who works full time should ever have to raise a family in poverty. 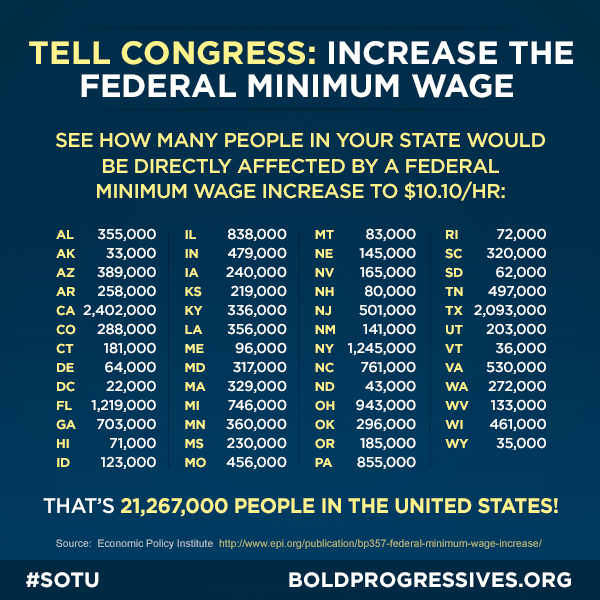 In the year since I asked this Congress to raise the minimum wage, five states have passed laws to raise theirs. Many businesses have done it on their own. Nick Chute is here tonight with his boss, John Soranno. John’s an owner of Punch Pizza in Minneapolis, and Nick helps make the dough. Only now he makes more of it: John just gave his employees a raise, to ten bucks an hour — a decision that eased their financial stress and boosted their morale. Tonight, I ask more of America’s business leaders to follow John’s lead and do what you can to raise your employees’ wages. To every mayor, governor, and state legislator in America, I say, you don’t have to wait for Congress to act; Americans will support you if you take this on. And as a chief executive, I intend to lead by example. Profitable corporations like Costco see higher wages as the smart way to boost productivity and reduce turnover. We should too. In the coming weeks, I will issue an Executive Order requiring federal contractors to pay their federally-funded employees a fair wage of at least $10.10 an hour — because if you cook our troops’ meals or wash their dishes, you shouldn’t have to live in poverty. That’s what health insurance reform is all about — the peace of mind that if misfortune strikes, you don’t have to lose everything. No one knows this better than those who serve in uniform. As this time of war draws to a close, a new generation of heroes returns to civilian life. We’ll keep slashing that backlog so our veterans receive the benefits they’ve earned, and our wounded warriors receive the health care — including the mental health care – that they need. We’ll keep working to help all our veterans translate their skills and leadership into jobs here at home. And we all continue to join forces to honor and support our remarkable military families. the state of our union is stronger. But we gather here knowing that there are millions of Americans whose hard work and dedication have not yet been rewarded. Our economy is adding jobs — but too many people still can’t find full-time employment. Corporate profits have rocketed to all-time highs — but for more than a decade, wages and incomes have barely budged. It is our generation’s task, then, to reignite the true engine of America’s economic growth — a rising, thriving middle class. It is our unfinished task to restore the basic bargain that built this country — the idea that if you work hard and meet your responsibilities, you can get ahead, no matter where you come from, what you look like, or who you love. Over the last few years, both parties have worked together to reduce the deficit by more than $2.5 trillion — mostly through spending cuts, but also by raising tax rates on the wealthiest 1 percent of Americans. As a result, we are more than halfway towards the goal of $4 trillion in deficit reduction that economists say we need to stabilize our finances. A year and a half ago, I put forward an American Jobs Act that independent economists said would create more than one million new jobs. I thank the last Congress for passing some of that agenda, and I urge this Congress to pass the rest. Tonight, I’ll lay out additional proposals that are fully paid for and fully consistent with the budget framework both parties agreed to just 18 months ago. Let me repeat — nothing I’m proposing tonight should increase our deficit by a single dime. It’s not a bigger government we need, but a smarter government that sets priorities and invests in broad-based growth. After years of talking about it, we are finally poised to control our own energy future. We produce more oil at home than we have in 15 years. We have doubled the distance our cars will go on a gallon of gas, and the amount of renewable energy we generate from sources like wind and solar — with tens of thousands of good, American jobs to show for it. We produce more natural gas than ever before — and nearly everyone’s energy bill is lower because of it. And over the last four years, our emissions of the dangerous carbon pollution that threatens our planet have actually fallen. But for the sake of our children and our future, we must do more to combat climate change. Yes, it’s true that no single event makes a trend. But the fact is, the 12 hottest years on record have all come in the last 15. Heat waves, droughts, wildfires, and floods – all are now more frequent and intense. We can choose to believe that Superstorm Sandy, and the most severe drought in decades, and the worst wildfires some states have ever seen were all just a freak coincidence. Or we can choose to believe in the overwhelming judgment of science — and act before it’s too late. America’s energy sector is just one part of an aging infrastructure badly in need of repair. Ask any CEO where they’d rather locate and hire: a country with deteriorating roads and bridges, or one with high-speed rail and internet; high-tech schools and self-healing power grids. The CEO of Siemens America — a company that brought hundreds of new jobs to North Carolina – has said that if we upgrade our infrastructure, they’ll bring even more jobs. And I know that you want these job-creating projects in your districts. I’ve seen you all at the ribbon-cuttings. Real reform means strong border security, and we can build on the progress my Administration has already made — putting more boots on the southern border than at any time in our history, and reducing illegal crossings to their lowest levels in 40 years. Stronger families. Stronger communities. A stronger America. It is this kind of prosperity — broad, shared, and built on a thriving middle class — that has always been the source of our progress at home. It is also the foundation of our power and influence throughout the world. The Coalition on the Environment and Jewish Life welcomed President Obama’s affirmation of his commitment to renewable energy and reducing our nation’s contribution to climate change, announced in his State of the Union address on Tuesday. “We praise President Obama for proposing the Energy Security Trust and prioritizing our nation’s response to the threat of global climate change,” said JCPA President and COEJL Co-Chair Rabbi Steve Gutow. The President has highlighted his understanding of the moral urgency of reducing our contribution to the climate crisis. We hope to see regulations that enable us to achieve our national goal of a 17% reduction in greenhouse gas emissions from 2005 levels by 2020. COEJL tries to lead the Jewish community in an effort to reduce our Jewish energy use by 14% by the fall of 2014, the start of the next Shmittah cycle on the Jewish calendar. “Reducing our nation’s reliance on fossil fuels would reduce serious environmental health risks, especially within our nation’s poorest communities, and ensure a cleaner and safer world for our children and future generations. As reflected by the President in his inaugural speech, we have a moral responsibility to ‘preserve our planet, commanded to our care by G-d,'” said Sybil Sanchez, director of COEJL. In terms of next steps, we urge stronger implementation of the Clean Air Act, for example a limit on carbon emissions from existing coal-fired power plants. Further, while continuing to focus on energy independence, we hope that all steps toward clean energy prioritize environmental protection. Further, sufficient safeguards and regulations must be applied in the production of natural gas and all other forms of energy in order to protect groundwater sources, surface water sources, air quality, human and animal health, infrastructure and ecosystems. See below for the complete transcript of the State of the Union Address along with illustrations. President Obama’s strong words in support of Israel tonight reflect his unyielding commitment to the safety and security of the Jewish state. From his leadership on the Iron Dome missile defense system and his vocal support for Israel’s right to defend itself to his commitment to achieving peace, the President has been Israel’s most important ally. We appreciate that the President reaffirmed his commitment to preventing a nuclear-armed Iran tonight, and that he continued to make clear that he stands with Israel as its neighbors experience instability and violence. We commend the President for his leadership in strengthening the U.S.-Israel partnership and making our special relationship a top priority of his foreign policy agenda. Because of his exceptionally strong support for Israel, we are eagerly anticipating his upcoming trip to the Jewish state. In November, Jewish-Americans voted overwhelmingly to give President Obama a second term. Tonight, the President made clear why. The policies laid out by the President on key domestic issues, such as immigration, climate change, protecting the environment, support for Israel, and other social issues are broadly supported by the vast majority of American Jews. Polls consistently demonstrate that the Democratic Party is the natural political home for American Jews and tonight’s address by the President provides even further proof. President Obama is right to make gun control a top priority of his second term. Too many American families have been devastated by gun violence and the time is right to put in place measures to prevent the next Sandy Hook, Tucson, or Columbine. NJDC has joined with the broader faith community to urge Congress to follow the President’s lead, and we will continue to be there as the President and Congress work towards passing new legislation. Full transcript of the President’s remarks follows the jump. A Call For Fairness or Class Warfare? By simply letting George W. Bush’s tax cuts and other measures expire, the annual budget deficit could be slashed by $7.1 trillion! Meanwhile, under pressure, Gov. Mitt Romney finally disclosed his 2010 tax return for last year showing an effective tax rate of 13.9% on $21.6 million of income (or over $33,000 per day) in 2010 and expects to pay 15.4% on $20.9 million in 2011. When Mitt Romney’s father Gov. George Romney (R-MI) ran for President he released 12 years of tax returns saying “One year could be a fluke, perhaps done for show.” When Mitt Romney applied for the job of Vice-President he provided John McCain with over 23 years of tax returns. (McCain passed over Mitt Romney and chose Gov. Sarah Palin as his running mate.) Now Mitt Romney is running for President and he expects one year of tax returns to satisfy everyone. People are especially concerned about the time he spent at Bain Capital. Mr. Romney was just following the tax laws when he paid a rate of 13.9 percent on income of more than $21 million in 2010. “If you change the law, we’ll pay the taxes,” Mr. Rubenstein said to scattered applause during a debate at Davos on the future of capitalism. Very few American households create tax forms the length of a Tom Wolfe novel. Romney’s effective tax-rate may not be all that much lower or higher than most households, it still sounds pretty low to the average person looking at what’s withheld from their wages. Although many more Americans have something in the market, almost none of them can imagine an IRA with $100 million in it. That’s strange even to most rich people. Tithing to the Church of Jesus Christ of Latter-Day Saints. Romney gives a serious amount of money to his church. [$4,100,000] And although lots of people give something, a tithe is a commitment most Americans actually can’t understand making. This detail makes Romney seem conspicuously religious in a way that most Americans, even most Evangelicals are not. Bloomberg just polled 1,209 investors to find out what they thought about the “Romney tax”. Even President Ronald Reagan supported the idea of the rich paying their fair share. We thank President Barack Obama for the clear and positive vision he laid out this evening in his State of the Union address — an address that showcased a ringing endorsement of Jewish values. American Jews are as concerned as all other Americans with our economy and jobs; the President’s plan to ensure that America’s is an “economy built to last,” and the steps he’s proposed regarding making taxes less regressive and ensuring shared responsibility, will ring true to the vast majority of American Jews. Similarly his direct discussion of wanting to sign comprehensive immigration reform, helping students to afford higher education and broadly prioritizing education speaks to the priorities of American Jews — and to most Americans. This President’s commitment to continue keeping Americans safe through common-sense regulations — be it in the field of health, safety, on Wall Street or elsewhere — is more crucial now than ever before as well. a world that was once divided about how to deal with Iran’s nuclear program now stands as one. was both important and deeply appreciated in this address. Throughout this State of the Union, one common thread was consistent; the reflection of the policy concerns of the vast majority of American Jews. We thank and congratulate the President for this positive, proactive approach to addressing those concerns in tonight’s State of the Union Address. Complete transcript after the jump. No, we will not go back to an economy weakened by outsourcing, bad debt, and phony financial profits. Tonight, I want to speak about how we move forward, and lay out a blueprint for an economy that’s built to last — an economy built on American manufacturing, American energy, skills for American workers, and a renewal of American values. I will go anywhere in the world to open new markets for American products. And I will not stand by when our competitors don’t play by the rules. We’ve brought trade cases against China at nearly twice the rate as the last administration — and it’s made a difference. (Applause.) Over a thousand Americans are working today because we stopped a surge in Chinese tires. But we need to do more. It’s not right when another country lets our movies, music, and software be pirated. It’s not fair when foreign manufacturers have a leg up on ours only because they’re heavily subsidized. I also hear from many business leaders who want to hire in the United States but can’t find workers with the right skills. Growing industries in science and technology have twice as many openings as we have workers who can do the job. Think about that — openings at a time when millions of Americans are looking for work. It’s inexcusable. And we know how to fix it. I want every American looking for work to have the same opportunity as Jackie did. Join me in a national commitment to train 2 million Americans with skills that will lead directly to a job. (Applause.) My administration has already lined up more companies that want to help. Model partnerships between businesses like Siemens and community colleges in places like Charlotte, and Orlando, and Louisville are up and running. Now you need to give more community colleges the resources they need to become community career centers — places that teach people skills that businesses are looking for right now, from data management to high-tech manufacturing. Recently, I spoke with a group of college presidents who’ve done just that. Some schools redesign courses to help students finish more quickly. Some use better technology. The point is, it’s possible. So let me put colleges and universities on notice: If you can’t stop tuition from going up, the funding you get from taxpayers will go down. (Applause.) Higher education can’t be a luxury — it is an economic imperative that every family in America should be able to afford. Do we want to keep these tax cuts for the wealthiest Americans? Or do we want to keep our investments in everything else — like education and medical research; a strong military and care for our veterans? Because if we’re serious about paying down our debt, we can’t do both. How this incredible transformation will end remains uncertain. But we have a huge stake in the outcome. And while it’s ultimately up to the people of the region to decide their fate, we will advocate for those values that have served our own country so well. We will stand against violence and intimidation. We will stand for the rights and dignity of all human beings — men and women; Christians, Muslims and Jews. We will support policies that lead to strong and stable democracies and open markets, because tyranny is no match for liberty. Above all, our freedom endures because of the men and women in uniform who defend it. (Applause.) As they come home, we must serve them as well as they’ve served us. That includes giving them the care and the benefits they have earned — which is why we’ve increased annual VA spending every year I’ve been President. (Applause.) And it means enlisting our veterans in the work of rebuilding our nation.